Jakarta, May 11th 2015 â€“ Further increasing its presence in Central Java, Archipelago International has recently opened its 4th hotel in the city of Semarang. Becoming the 35th favehotel in Indonesia and the 1st favehotel in Semarang, the new favehotel Diponegoro Semarang joins Archipelago International's Quest Semarang, NEO Candi and Aston Semarang. Semarang is a city on the north coast of Java and is the capital and largest city of the province of Central Java. A bustling city, Semarang is extremely popular with business travelers and more recently, leisure travelers are also beginning to explore the area. Strategically located in the heart of Semarang with a central address and easy access to and from Ahmad Yani Airport and Tawang Train Station, favehotel Diponegoro Semarang will be a prime choice for budget-oriented business and leisure travelers seeking a contemporary, comfortable and stylish hotel. 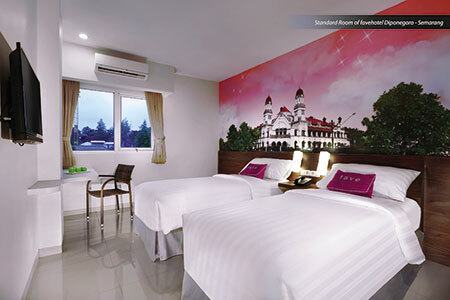 Surrounded by Semarang's culinary and entertainment destinations, the 6-story hotel holds 108 stylish rooms, each one modern, functional and super-clean with cutting-edge LED TVs, fast and reliable complimentary WiFi, security key card systems, air conditioning, in-room safes and top of the line beds with high knot-count cotton linens. favehotel Diponegoro Semarang also offers a complete range of facilities including a signature Lime Restaurant serving up delicious breakfasts and light, healthy lunch choices, alongside Indonesian favorites throughout the day. For business needs, there is also 4 modern meeting rooms and ample parking spaces, setting new standards for economy business accommodations. â€œIn line with the increasing middle class population in Indonesia, as well as mushrooming low-cost airlines, more people are holidaying away from their hometowns and doing business as budget travelers. Semarang is a popular destination for just this, together with a high number of domestic travelers stopping en-route between Jakarta and Surabaya. favehotel Diponegoro Semarang will cater perfectly to the area's value-conscious guests who are after a comfortable stay at an affordable price in this convenient location.â€œ Said Ms. Tenaiya Brookfield, Vice President of Sales and Marketing at Archipelago International. Seen in the image from left to right : Mr. Yudha Pranoto as Hotel Manager favehotel Diponegoro Semarang, Mr. Petrus Agus Setiawan as owner of favehotel Diponegoro Semarang, Mr. Bambang Kuncoro as Marketing Director of Bank BPD DIY, Mr. Alan Tjahjadi as President Commissioner PT. Restu Griya Asri, Mr. Lukas Samali as Vice President Archipelago International Indonesia and Mr. Eko Wibowo as owner of favehotel Diponegoro Semarang during soft opening event favehotel Diponegoro Semarang. favehotels currently operates 35 hotels throughout Indonesia and Malaysia out of which 11 are in Jakarta and 4 in Bali and has a development pipeline of more than 40 hotels in Indonesia, Malaysia and the Philippines. Archipelago International is one of Indonesiaâ€™s leading hotel operators with a portfolio of over 100 hotels and 15,000 rooms. As a continually expanding brand, Archipelago International has a development pipeline exceeding 95 properties in Indonesia, the Philippines, and Malaysia. Archipelago International hotels operate under the brands: Grand Aston, Aston, Aston City, Alana, Harper, Quest, Quest Vibe, favehotels, NEO, and Kamuela. Archipelago Internationalâ€™s properties range from ultra-luxurious villas with private pools to select-service, economy-class hotels to serviced-apartment residences, thus offering Indonesiaâ€™s largest and most comprehensive hospitality network.